DAP-81 is a diaminopyrimidine derivative that targets PLKs, destabilizing kinetochore microtubules. CFI-400437 is potent against PLK4 (IC50 = 0.6 nM) and selective against other members of the PLK family (>10 uM). 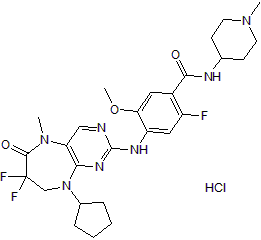 ON1231320, also known as GBO-006, is a Polo-like kinase 2 (PLK2) inhibitor. SBE13 Hydrochloride is a potent and selective Plk1 inhibitor, with an IC50 of 200 pM; poorly inhibits Plk2 (IC50>66 μM) or Plk3 (IC50=875 nM). Ro5203280 is a small-molecular PLK1 inhibitor that is structurally similar to BI2536, but with improved activity. TAK-960 is an orally available, selective inhibitor of polo-like kinase 1 (PLK1), with an IC50 of 0.8 nM at 10 μM ATP; also shows inhibitory activities against PLK2 and PLK3, with IC50s of 16.9 and 50.2 nM, respectively. TAK-960 hydrochloride is an orally available, selective inhibitor of polo-like kinase 1 (PLK1), with an IC50 of 0.8 nM at 10 μM ATP; also shows inhibitory activities against PLK2 and PLK3, with IC50s of 16.9 and 50.2 nM, respectively. CFI-400945 fumarate is a potent, selective and orally bioavailable PLK4 inhibitor with a Ki and an IC50 of 0.26 nM and 2.8 nM, respectively. 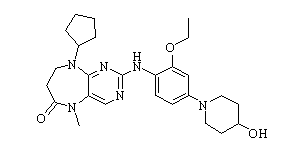 NMS-1286937 is a potent, selective and orally available PLK1 inhibitor, with IC50 of 2 nM.